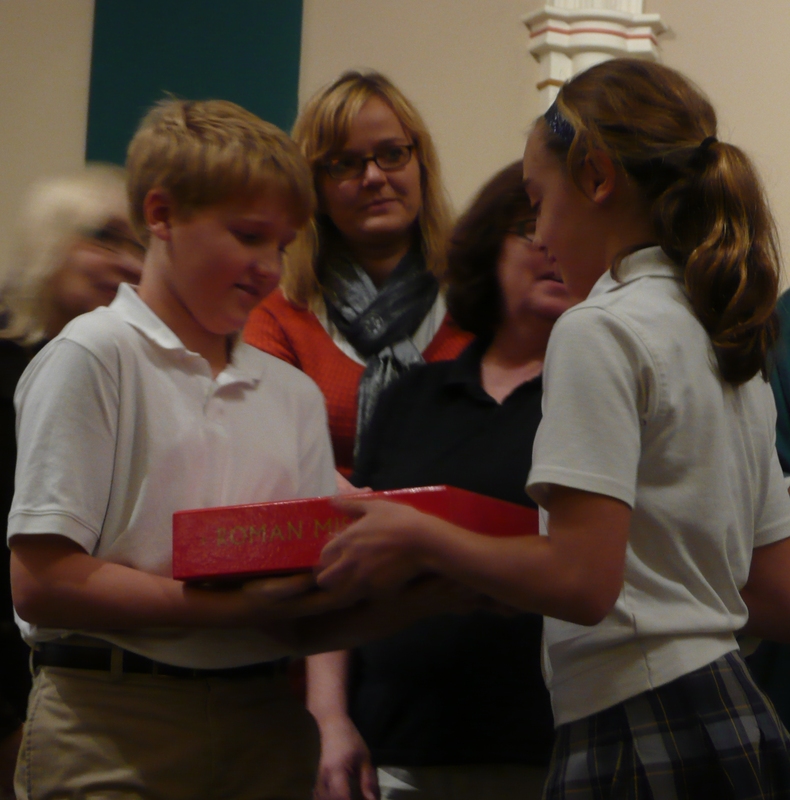 At the end of 8:00 a.m. Mass, I thanked the young woman for her kindness to me. She was in the pew next to me this morning at the Franciscan Monastery of the Holy Land in Washington, D.C. Yes, I know that I probably should have been concelebrating with the priests, but sometimes it is helpful for a priest, and in this case it was helpful for me, to experience Mass from viewpoint of the congregation. The Franciscans, for what reason I do not know, are further along in using the new English translation of the Mass. I must have looked lost when, not singing the Gloria, everyone starting speaking the words of the “new” Gloria. The young woman moved closer, and held between the two of us a card on which all the people’s parts were printed, with the “different” words in a heavier, bolder font. As I looked around, everyone seemed to know where to find that card, except me. 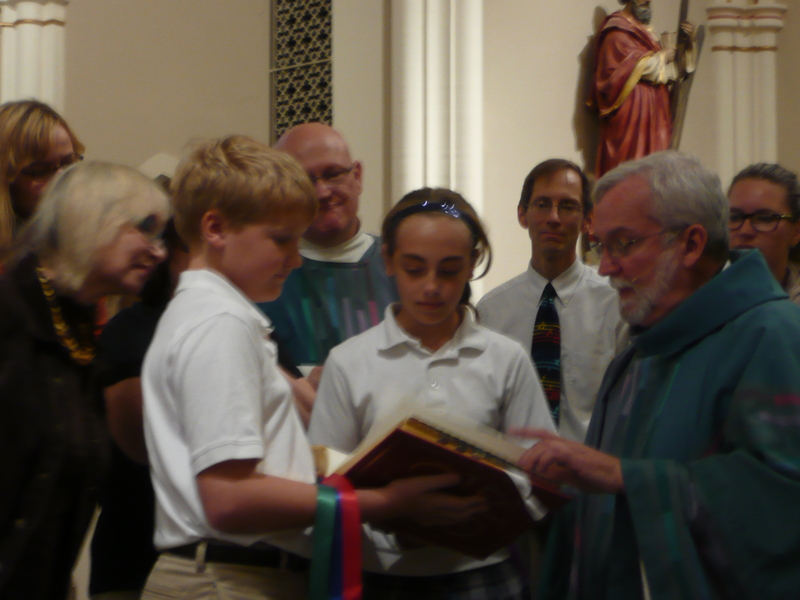 That young woman, in her kindness, helped me through the Mass. Two thoughts come to my mind. It will be important, come November 27, for the people in the pews at St. Andrew to help each other through Mass, until we all settle in with the new translation. Expect others to help you. And make it your own intention to help others. Get yourself as ready as you can. And then look for ways and means to help those who are sitting near you, especially those who look as lost as I must have looked to the woman next to me this morning. The other thought that came to mind was that you will be helping me, or whoever the priest happens to be at the altar. For some weeks now, I have been thinking about what Father Ken and I need to do, right now and on those first Sundays of Advent, to help the transition be as smooth as possible, in other words, to help you make the transition. But wait a minute. We’re all in this together, aren’t we? We’ll work together, each doing what each of us can do. It is a relief for me to realize that it is not totally up to me and Deacon Tim – and Dovile and the choir – to make this transition happen. The Mass belongs to all of us. This new translation is given to all of us. You’ll help me as much as I help you. You’ll help the choir as much as the choir helps you. Phew! That feels much better. The tension is leaving the back of my neck. “That was awkward,” is okay. “I don’t like that,” is not okay. That is my rule for myself until May 27, six months from November 27. On the First Sunday of Advent, November 27, the new English translation of the Mass will be used for the first time. There will inevitably be awkward moments. It will be okay to note them. It might even be good to celebrate them. But it will not do much good to complain about them. In the new translation some of the wording in the prayers, dialogues and responses will be slightly different from the wording that we Catholics, and we Catholic priests, have used for the last forty years, or for as long as you have been alive, if you are not yet forty years old. It will be okay to point out the awkwardness, to share the awkwardness with a smile and maybe even with a laugh. But complaining will not help us to make progress or to be prayerful. My new rule – a rule for myself – will be: “No Complaining for Six Months.” We priests, maybe more honestly I should say, this priest (I) can be quick to say what I like and what I don’t like about the new translation of a word or phrase that we will use. But I would do well just to pray, using the words that the Church gives us to pray, and not analyze, object or change any word that is in that brand new Roman Missal that arrived in the mail a couple weeks ago. So, if another priest or a parishioner complains, I must listen, but I do not need to join in, further or add to the complaint. Perhaps in six months I will look back and discover that what was awkward is no longer so, and what I did not like, I like. Even if not, what the Church has given me to pray as a priest at Mass, I will pray at Mass. You may want to stay away from me on May 28, when my rule expires. But let us hope that on May 29 all will be well. 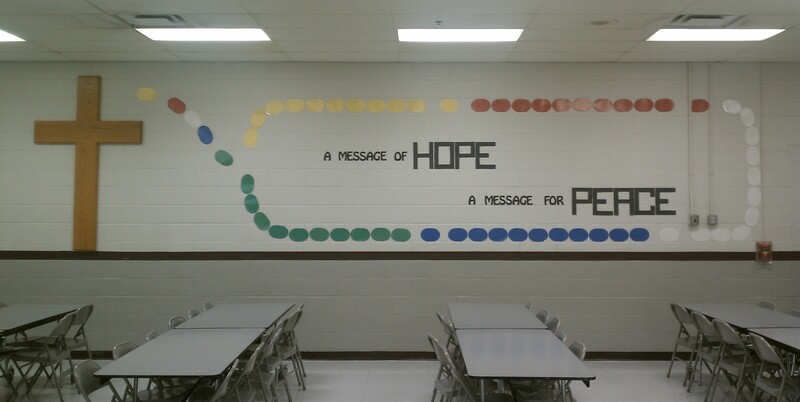 The message was one of HOPE. The prayer was for PEACE. 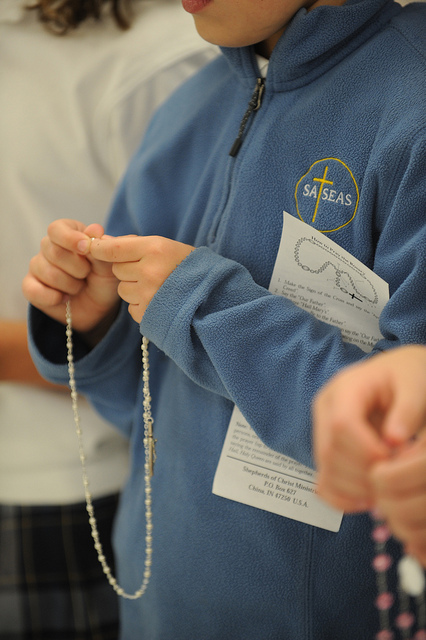 This time the children of our Catholic school at St. Andrew-Saint Elizabeth Ann Seton prayed the rosary not just “for” our sisters and brothers in the Holy Land. They prayed “with” their brothers and sisters of the Holy Land, during the visit of four Palestinian teachers from the Holy Land. Each decade of the rosary on the wall and in their hands was a different color. For each decade there was a different intention and reflection. The first mystery of the five decade rosary was the “Visit of the Magi.” The color was green. The symbol was hope. The language was English. The second mystery was “Jesus Speaks with the Samaritan Woman.” Appropriately, it was prayed in Arabic by the teacher from Nablus, the site of Jacob’s well, from which the teacher and her students still drink. The symbol was peace and unity; the color was blue. Back to English, the third mystery, “Jesus Cures the Centurion’s Servant,” with white being the color, carried with it a message of healing, light and understanding. 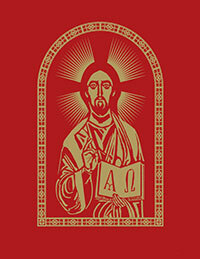 The teacher from Beit Jala (Bethlehem) led the fourth mystery, “Jesus Sends Out His Disciples,” with its symbol of the Holy Spirit and its color of red. 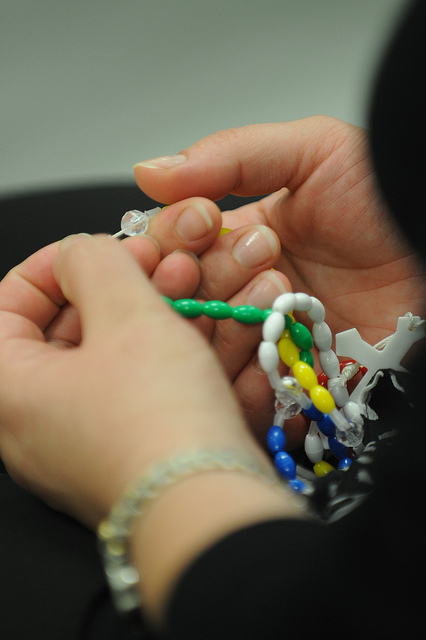 The children finished with the fifth mystery in English, “The Conversion of Paul.” The yellow beads of the decade brought with them thoughts of optimism and joy. At the end of each Our Father, Hail Mary and Glory Be there was an Amen, heard in English and in Arabic. The sound of “Amen” in English is not much different from the sound of “Ameen” in Arabic. In the praying, the children realized that the teachers from the Holy Land were not much different from the teachers in their own classrooms. The visiting teachers probably saw in the faces and voices of our students the hopes and dreams of their own students back home in Nablus and Beit Jala. Thank you, Theresa, Kellie and John! 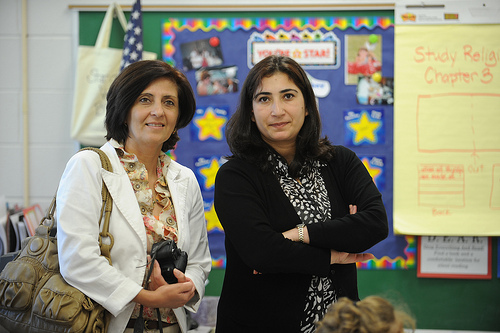 Our local “Milford-Miami Advertiser” reported twice, with photos, on the visit of the Palestinian Educators to Milford. Enough thanks cannot be given to Theresa Herron, editor, and to reporters Kellie Geist-May and John Seney. They and their Community Press could not have done more. “Palestinian educators share experiences” by John Seney was published on October 13, with accompanying photos of the children and classrooms of the St. Andrew campus of SASEAS school. Take a look and read by clicking on the title. 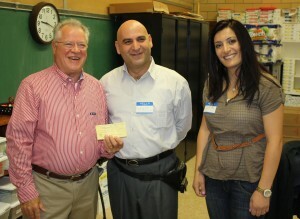 “Palestinian educators to partner with Milford, Cincinnati teachers” was published on September 23. Clicking on the headline will take you to Kellie Geist-May’s article. 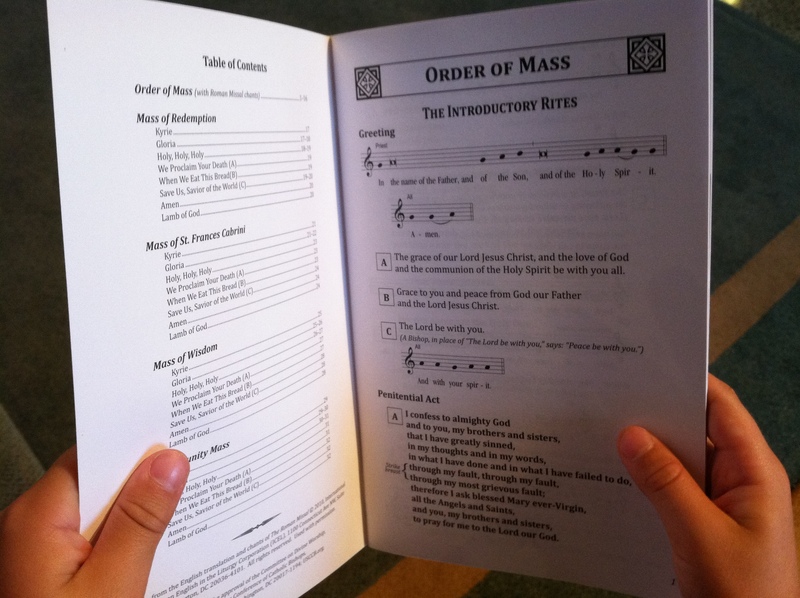 It was prepared by our local Worship Office, after extensive and comprehensive study and recommendations from Music Directors throughout the Archdiocese. You find it in the pew near you. 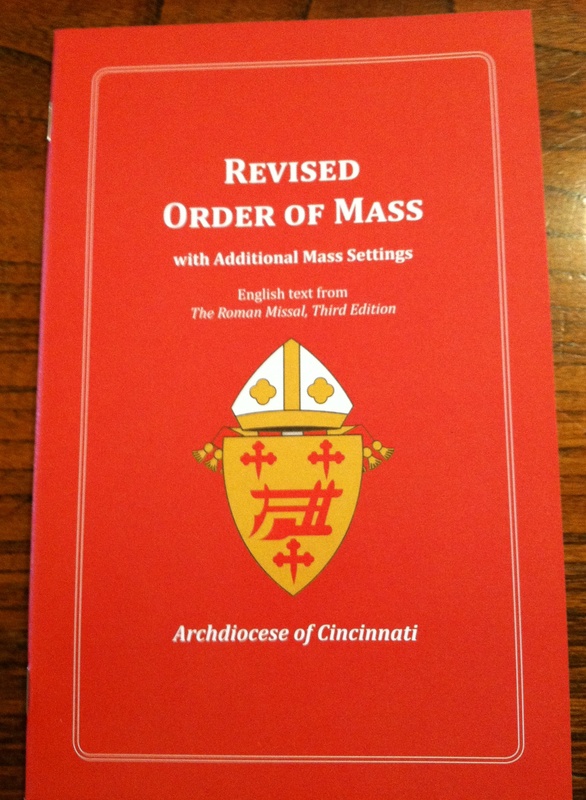 The red booklet, “Revised Order of Mass with Additional Mass Settings,” will help us help each other. Notice that I say, “help each other.” I will help you, and you will help me. That is how we do things here at St. Andrew. This weekend we begin singing the Holy, Holy, Holy (Sanctus) and the Memorial Acclamation (The Mystery of Faith) from the Revised Mass of Redemption. By the time we publicly and officially open the new Missal, we will be comfortable with the “new” words as sung in the Mass of Redemption. During the homily at all the Masses on the weekend of November 13, Deacon Tim will introduce us to the new chants that will be sung every Sunday before and after the Gospel reading, and to the chanted dismissal at the end of Mass. At all the Masses on the weekend of November 20, I will use the homily time to point out and to sing with you a “few of my favorite things” from the new Missal, which you will find in the red booklets. We will also bless the Missals for their first use on the next Sunday. The edges of the pages were gold. As they held it, they let me open it up to look inside. The book opened to the feast of the Annunciation. A full size picture was in color. The first letter of paragraphs of the prayers were capitalized and decorated. We found the feast of St. Elizabeth Ann Seton and put a ribbon at that place. St. Andrew, on November 30, got the red ribbon, being an Apostle. The Church has given us a great big gift. 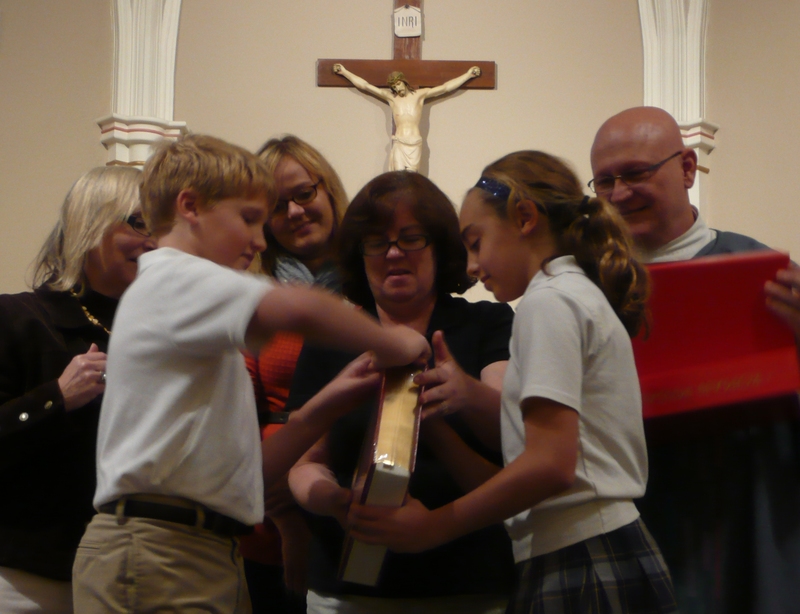 Today at St. Andrew-St. Elizabeth Ann Seton we received the gift and opened it. Kyle took it into the sanctuary and opened it up on the altar. We are ready for Kyle’s birthday. I mean, we are getting ourselves ready – and are getting anxious – for the First Sunday of Advent to arrive. The new English translation of the Roman Missal, Third Edition has arrived and is in our custody. We love it! They begin their presentation about their Catholic school by saying that there are 650 students, including 61 Christians and 4 Samaritans. “What? There are Samaritans in your school? … and only 61 of the 650 children in your school are Christians? 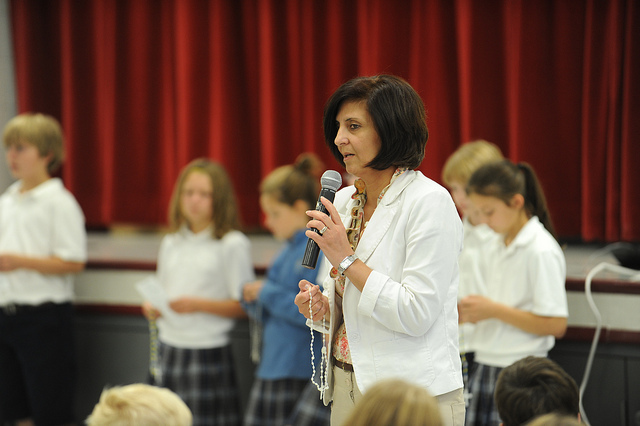 … and it’s a Catholic school?” They have our attention. The two Palestinian educators, the principal and an English teacher to 1st and 6th graders, are from Nablus in the West Bank. Nablus is the home of Jacob’s well. Remember Jacob’s well, where Jesus asked the Samaritan woman for a drink? Miss Abeer and Miss Ruya, and the people of Nablus, still drink water from that well. And there are still Samaritans in their town, 700 of them, which is almost all of the Samaritans left in the whole world. In a total population of 346,000 that is not a big number, but neither is the number of Christians: 750. Christians and Samaritans are obviously in the minority among the majority, the people of the Muslim faith. There are four priests in Nablus: Greek Orthodox, Greek Catholic, Roman Catholic and Anglican. The fact that there are four churches is an indication that once there were many Christians in Nablus. Nablus is known in the West Bank for its sweets and its soap. The Catholic school at which Miss Abeer is the principal and at which Miss Ruya is a teacher is also well-known for the excellent education it provides for all the children, Catholic, Muslim and Samaritan, who come through its doors and into its classrooms, whether or not their families have the money to pay the tuition. 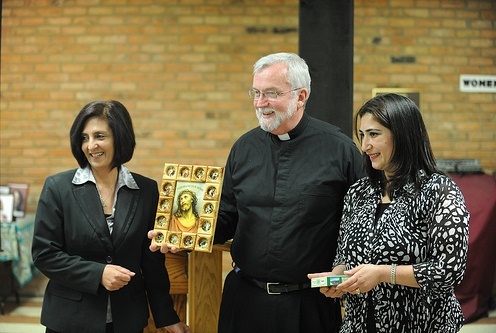 Along with an olive wood cross with images of the Stations of the Cross, Miss Abeer and Miss Ruya brought me a box locally made soap. The sweets will be waiting for me when I make a return visit to their homes, their school and their city of Nablus in Palestine. After our visit with Archbishop Dennis Schnurr and two of his office directors, Dr. Mike Gable (Missions) and Dr. Jim Rigg (Education), to thank the bishop and to receive his blessing, we went to the National Underground Railroad Freedom Center. It took visitors from 6,000 miles away to take me to a museum in my hometown. After the presentation, we snapped a photo of three women – the “slave” and two Palestinians, one from Nazareth carrying an Israeli passport and the other from the West Bank carrying a Palestinian passport. Three women, on a journey toward rights and freedom, holding on to family, with nothing as sacred as home – how alike they were! 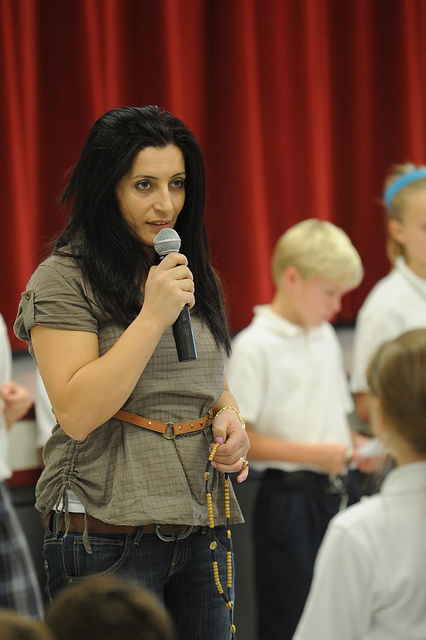 A lot of Arabic was heard in our classrooms and hallways today at St. Andrew-St. Elizabeth Ann Seton School. “Marhaba (hello) … Shokran (thank you) … Afwan (you’re welcome),” were coming from all our K-8 students, punctuated with grins and hugs. 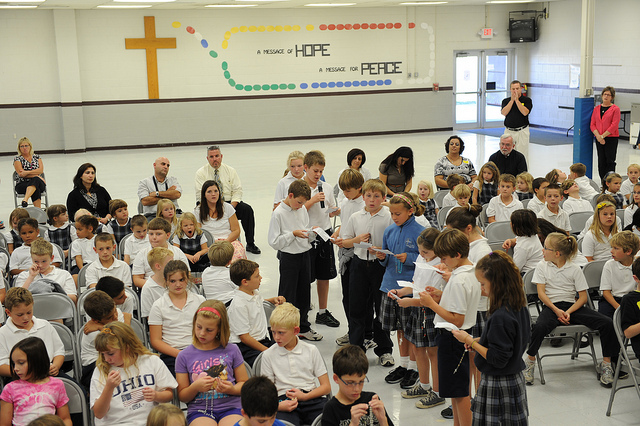 Our visitors were teachers from Catholic schools in Beit Jala and Nablus in the West Bank. Guided through our school by our principal, the Christian teachers glided into rooms of children, as if they were walking in on groups of their own students back home in Palestine. The children were all eyes and ears, as they learned that, yes, in the Catholic schools in the Holy Land, children wear uniforms and play soccer, that they go to school on Saturday, but not on Friday and Sunday, and that many of their classmates are Muslims. After being asked by Miss Abeer and Miss Ruya whether they knew the Bible story about the Good Samaritan, and about Jesus meeting a Samaritan woman at Jacob’s well and giving her a drink, the children seemed amused that people in Nablus still drink from the same Jacob’s well and that there are six Samaritan children in the Catholic school. The children were impressed when Miss Eman and Mr. Waseim told them that Beit Jala was right next to Bethlehem, and that they lived where Jesus was born. But they did not like hearing that the students in Beit Jala could not go on field trips because of a high wall that has been built around their town to keep them in. They were puzzled when they heard that, if the first Christmas took place today, Mary and Joseph wouldn’t be able to get into Bethlehem because 0f that high wall.